1973 Mercedes-Benz 350SE - This is a very cool Euro spec car. These were short wheelbase cars (The SELs had a longer wheelbase) with a 3.5 liter V8 in them. They were never officially sent to North America. This one was privately imported into Canada 15 years ago and restored. The seller calls is a "very nice & clean example". 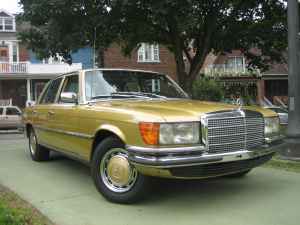 I'm not crazy about the color, but gold was a very popular color for German cars back in the late 1970s and early 1980s and I wouldn't change it. The Euro bumpers and headlights look great. Located in Toronto, Canada, click here to see the Craigslist ad. 1993 Volkswagen Fox - The Fox is not a car you often see in this condition. In performance and style it was overshadowed by the Jetta. It was an inexpensive, disposable car. 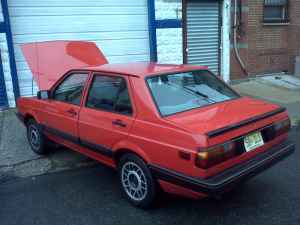 This adult owned Fox has been tastefully modified and appears to be in great shape. On the track or in a quick street race, you'd surprise the hell out of the owners of some better known German and Japanese cars with this car. Located in Elizabeth, NJ, click here to see the Craigslist ad. 1985 Citroen CX Turbo Diesel Wagon - In his listing the seller writes, "Air horns give the sound that is typically French - A loud 'parp' which gets everyone's attention!" I suspect that the sight of a 16' long Citroen station wagon gets everyone's attention long before they hear the horns. These cars are completely insane. Very cool and very insane. The automotive world lost a lot when Citroen stopped building cars like this. Located in New Orleans, LA, click here to see the eBay listing. 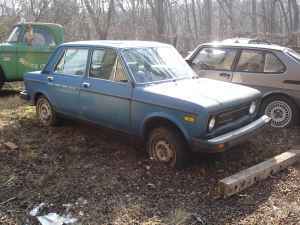 1976 Fiat 128 - I'm not very spiritual person and I have no idea if there is an afterlife. However, if there is a heaven, there are a few earthly deeds should automatically entitle you to admittance... 1) Saving a human being's life. 2) Adopting a dog or cat from a shelter, or taking in a stray. 3) Saving an old car from being crushed. This guy is going to heaven. (Or, if there's no heaven, but reincarnation exists, he's coming back as an Aston Martin, not as a Kia.) He saved this Fiat from the crusher. The seller says that it's not running or driveable, but is very solid. This car has already been saved from the crusher and I don't know if restoring and driving it will automatically get you on to God's guest list. It will, however, make your life here on earth a little more interesting and fun. Located in Downingtown, PA, click here to see the Craigslist ad. hmm, good thing i saved my alfetta!